Today, the idea of online shopping as a business has become a separated model for entrepreneurs. Moreover, most of the customers have used to search and buy products online. It is more convenient and the proposition is much wider. As a result, retail is moving online, and some brands start their business from an online shop instead of traditional one. But, 50 years ago the situation was completely different. Why eCommerce Development Has Started? In deep 60x, business owners used the internet only to send orders and invoices to each other. The data transfer was executed using Electronic Data Interchange method that was too complicated for most of the users. Nevertheless, such interaction became more and more popular because of its speed and reliability. The following years can be named the beginning of eCommerce Development because the described technology was improved and revamped. Naturally, the process was full of inventions that seem to be funny today. But, each of them was a new brick in eCommerce sphere that we know today. On the penultimate stage of eCommerce Development, in 2008, Varien company has introduced Magento to the public. After this event, the new era was begun. Business owners have got new opportunities to deliver information about products to customers. Nowadays, mobile commerce is taking a huge part, but for how long? What will be the next? If you have some suggestions, feel free to leave them below, in comments. 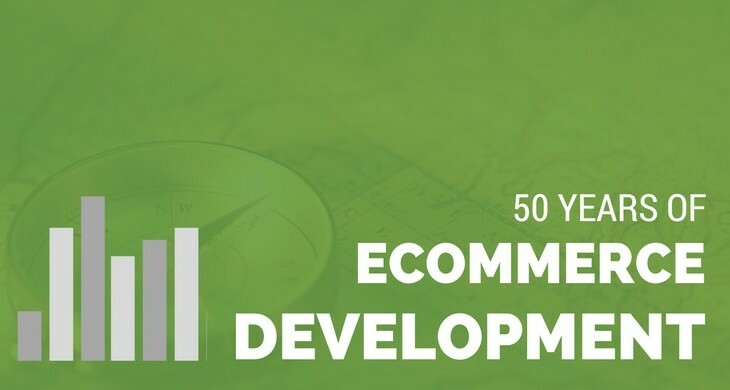 Meanwhile, take a look at 50 Years of eCommerce Infographic, provided by WebAlive. It shows some interesting facts along with the dates for the best convenience. As you see, Magento made a revolution in the online business world in 2008 and still does the same each day. Orange35 Team can prove this fact and provide you with the best quality service. Moreover, if you are starting an online business, order Magento eCommerce Website now. To do this, contact our Support Team now or email at support@orange35.com.